Galagadon, (c) Velizar Simeonovski, Field Museum. Galagadon teeth. Image: Terry Gates. Cretaceous aquatic ecosystems were amazingly diverse, containing most clades of extant aquatic vertebrates as well as an array of sharks and rays not present today. Here we report on the chondrichthyan fauna from the late Maastrichtian site that yielded the Tyrannosaurus rex skeleton FMNH PR 2081 (“SUE”). 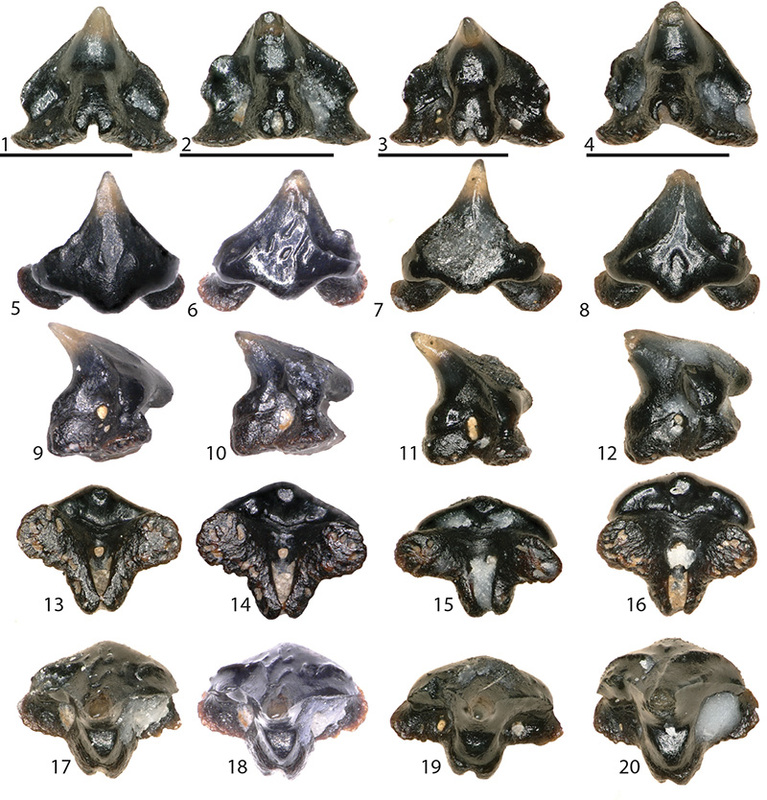 Significant among the recovered fauna is an unidentified species of carcharhinid shark that adds to the fossil record of this family in the Cretaceous, aligning with estimates from molecular evidence of clade originations. 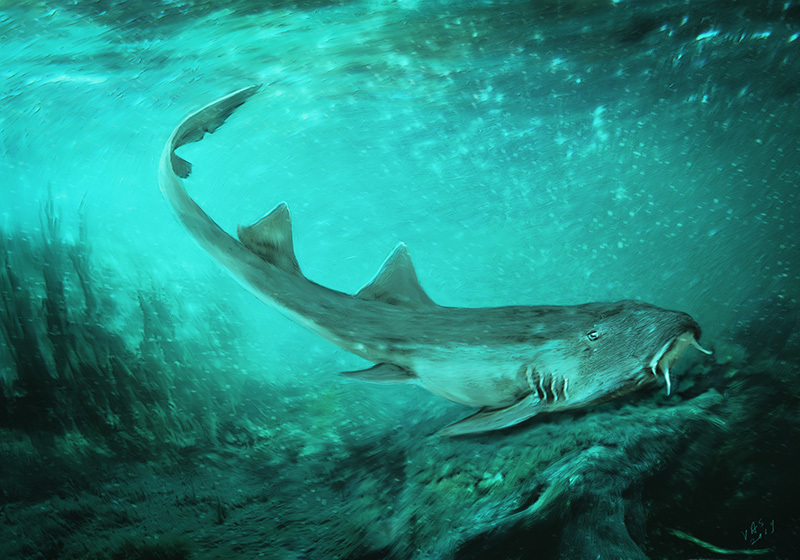 Additionally, a new orectolobiform shark, here named Galagadon nordquisti n. gen n. sp., is diagnosed on the basis of several autapomorphies from over two-dozen teeth. Common chondrichthyan species found at the ‘SUE’ locality include Lonchidion selachos and Myledaphus pustulosus. Two phylogenetic analyses (Maximum Parsimony and Bayesian Inference) based on twelve original dental character traits combined with 136 morphological traits from a prior study of 28 fossil and extant taxa, posited Galagadon in two distinct positions: as part of a clade inclusive of the fossil species Cretorectolobus olsoni and Cederstroemia triangulata plus extant orectolobids from the Maximum Parsimony analysis; and as the sister taxon to all extant hemiscyllids from the Bayesian Inference. Model-based biogeographical reconstructions based on both optimal trees suggest rapid island hopping-style dispersal from the Western Pacific to the Western Interior Seaway of North America where Galagadon lived. Alternatively, the next preferred model posits a broader, near-global distribution of Orectolobiformes with Galagadon dispersing into its geographic position from this large ancestral range.